Tom Eaton's latest release is a thoughtful, peaceful album filled with gently flowing streams of music that offer the listener a perfect opportunity to kick back at the end of a busy day with the musical equivalent of a nice cup of hot herbal tea. I very much agree with the idea that music is a healing agent to the many stressful situations that we face every time we step out the door and that it should be applied liberally whenever we feel the need to let go of situations that cling to us after we come home for the day. The great thing about Indesterren is that it not only keeps the listener grounded and relaxed with the organic feel of Tom's keyboards that he does so well but it also manages to open the door slightly to the space beyond our terrestrial point of view via his skillful blending of synths into his music so that it reaches out to the stars that twinkle in the night sky. It creates a mindset in the listener which is both a stationary relaxing moment in time and at the same time he takes us on a drifting journey to new and unexplored places. He did a great job of offering up both of these scenarios in a few of the songs on this collection without letting either dominate the other. Such as in Waltz and Venus. Feet on the ground head in the sky so to speak. With the addition of Jeff Oster's flugelhorn on a couple of tracks Tom also was able to balance the music in a third scenario which would be a light dash of laid back jazz that might be found late night in a darkened music club with a spotlight shining on the horn player on stage. The song Venus becomes a trifecta experience as it brings together in perfect harmony Tom's keyboard work as the grounding element, Tom's synths as a point of spatial reference beyond this world and Jeff's flugelhorn that adds a soulful earthy touch to the whole composition. As the composer, producer, engineer and multi instrumentalist on this project Tom has shown that he is more than capable of taking his compositions from that initial spark of inspiration and bringing them fully formed and realized into a polished form that was quite impressive to me the listener. Indesterren also shows that an album doesn't have to be classified as either space music or piano music because he has managed to bring the two together on this release so that they co-exist not only on the album but also in the mind of the listener as they are held between two worlds during the course of listening to this album. While there is a variety to the 12 songs that Tom has brought together to form Indesterren it is apparent that they were carefully chosen so as to create the flow of this album from beginning to end. The anchor for this project is Tom's keyboards that act as the constant underlying foundation for everything else that goes on for the 78 minute duration of this release. It is this solid base of playing that allows him to layer upon it the other aspects of the music that offers depth and expressiveness to his compositions. Before you go blasting off to space you need to make sure that the vehicle that will take you there is well built and that the launching pad has a good foundation from which to leap to the sky from and so it is with Tom's music as well. With many ambient albums that I review it is difficult to pick out particular tracks and say that this is representative of the whole and that is because the whole tends to be an organic piece of music that moves and breathes as a single entity not as individual tracks pulled out of the context of that entity and looked at separately from the rest of the body. 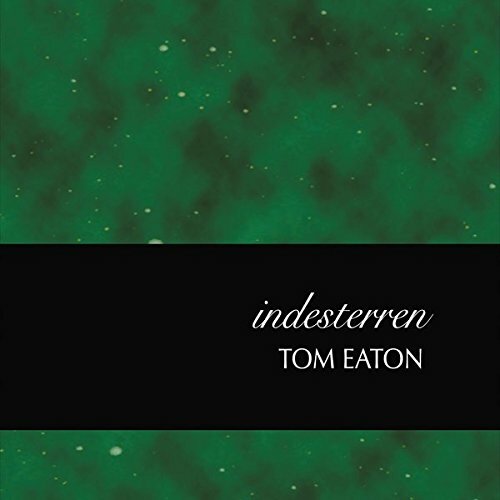 So it is with Tom Eaton's Indesterren album and the music that he has chosen to weave together into an organic performance that is best discovered as an album and not as individual tracks. Perhaps Tom's experience as a co-producer and engineer of projects recorded at Imaginary Studios has shaped and attuned his musical sensibilities so as to allow him to apply what he has learned behind the board with other musicians to his own music to the delight of listeners who might pick this album up in the future. Overall this album manages to occupy a comfortable space that effectively spans several styles of ambient music without ever becoming too busy or unfocused by trying to include too much in each composition. Tom demonstrates that he is an accomplished musician/producer as he deftly manages to keep all of these elements in balance while delivering a satisfying musical experience that will leave listeners wanting more even after the last refrain has faded away. Fortunately for us as listeners that just means that we have to hit play again and listen to the whole thing a second time or third as the case may be.